A gift that's simply lovely. Exotic fresh cut Cymbidium Orchids accented with Waxflower blossoms and curly branches. It's a bit of the tropics, delivered in a sweet cube vase. Please Note: We have used White Cymbidium Orchids for this bouquet. If you would like another colour, please specify in the special instructions section during the order process. Style of vase may vary. To ensure the best arrangement, flower varieties and accents may vary. Substitutions may be necessary due to seasonal availability of some flowers. Sometines all she needs is a little "pink-me-up!" An ideal pick for anyone whose favourite colour is pink. This stylish mix is full of and comes presented in a clear glass bubble bowl she'll use again and again. Just one look at this truly original arrangement will leave her smiling bigger and brighter. Filled with pink carnations, hot pink roses and light pink roses ... we think it is an ideal gift for Mother's Day, Anniversaries, Birthdays or any other day that you want to put someone special in the spotlight. Substitutions may be necessary due to seasonal availability of some flowers. 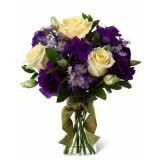 Blooms with sophistication and grace will create a special moment for your recipient. Arranged to perfection in a clear square vase, this is a stylish way to extend your warmest wishes and affection. 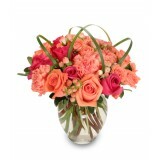 This bouquet is feminine and full of colour. A sophisticated combination of multi-toned pink flowers are contrasted with lavender roses. It is the perfect gift for someone who deserves all the frills. 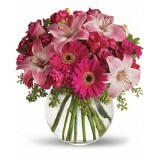 This Pink at Heart Bouquet grabs everyone's attention with it delicate pink blooms. 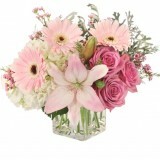 Win your special recipent over with feminine pink flowers arranged to make the perfect impression. This flower bouquet is ready to help you express your most heartfelt Mother's Day, Thank You or Happy Birthday wishes! Established in 1905, Cassidy's Flowers is one of the Greater Metropolitan Toronto and York Region area's oldest and finest florists, and today it is still a family-owned and operated business. "Best Florist" People's Choice Award for 20 years in a row! Cassidy’s Flowers has officially been granted the permission to use FTD’s Master Florist Logo. Only a few Outstanding FTD members are allowed to use this logo and Cassidy’s Flowers is among these members. “Awesome service! I just wanted to send a quick note stating how very impressed I was with your services today! I ordered online and within just a few hours, my friend received her beautiful flower delivery! Thank you for providing such fast, efficient and convenient service! I will definitely recommend your store/website to everyone I know! “I am very impressed with the service you provide. Your product is beautiful and the online interaction is incredibly convenient. I love the way you inform your customers of the delivery date and then inform them again once the delivery has been made. Fantastic customer service!